The range of mental health professionals includes psychiatrists, psychologists, psychotherapists and counsellors. Mental health professionals work with people of all ages and from all walks of life. Psychiatrists are medical doctors. They understand our emotions, feelings, thoughts and how the brain works. They can treat mental illness with psychological treatments (talking therapies). Psychiatrists understand the links between mental and physical problems. They can prescribe medications for mental health issues such as anti-depressants and mood stabilisers. Psychologists also understand our emotions, feelings, thoughts and how the brain works. There are many different types of psychology specialties. Psychologists who work with mental illnesses are clinical psychologists. Like psychiatrists, clinical psychologists treat mental illness with psychological treatments (talking therapies) but psychologists can't prescribe medications. Psychotherapists treat people with talking therapy. They help people with long-term therapy for mental illnesses like depression and psychosis. They also help with deep-rooted issues like childhood trauma, addictions and compulsions. Counsellors also use talking therapy and usually specialise in day to day issues such as couples counselling, addictions counselling and workplace counselling. If you aren't sure which type of health professional to see, ask your GP. Mental health professionals can help you with mental illnesses such as addiction, anxiety, bipolar disorder, depression, eating disorders, psychosis and stress. They can also help with issues like grief, relationship problems, work issues, parenting, abuse, self-esteem problems, and life changes such as a new baby or divorce. Your GP will normally refer you to a psychiatrist if they think you need to see one. You can also find a psychiatrist on Healthpages. 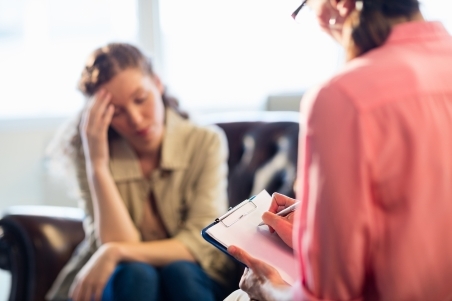 Your GP might be able to help you find a clinical psychologist. You can also search for a clinical psychologist on the New Zealand College of Clinical Psychologists website. You can find a psychotherapist or counsellor through the New Zealand Association of Counsellors (NZAC), the Mental Health Education and Resource Centre (MHERC) or in the Family Services Directory. Some employers offer employee assistance programmes (EAP). An EAP is a confidential service that your employer pays for. The programme has qualified, registered and experienced professionals who can help you and your immediate whānau/family talk through issues that may be affecting your wellbeing or your ability to do your job. Talk to your manager or human resources representative about whether your employer offers an EAP. Psychiatrists are medical doctors so they must complete a six-year medical degree. After graduation, they must work for at least one year to gain further medical training. They must then complete at least three years of basic psychiatry training and two years of advanced psychiatry training. After meeting all the requirements, psychiatrists are awarded a fellowship of the Royal Australian and New Zealand College of Psychiatrists (FRANZCP) qualification. Psychotherapists need to be registered with the Psychotherapists Board of Aotearoa New Zealand. There are two ways for psychotherapists to get registered. One way is to attain a qualification that the board recognises, like a masters degree or diploma in psychotherapy. The other way is to be assessed by the board as having the required mixture of psychotherapy skill, knowledge, professional development and psychotherapy qualifications. Anyone can set themselves up as a counsellor but most employers require their counsellors to be members of relevant professional bodies or be working towards membership. Full members of the New Zealand Association of Counsellors must have at least a level 6 diploma with 500 hours of supervised clinical practice. Written by HealthInfo clinical advisers. Page created October 2018. Last updated March 2019. New Zealand Association of Counsellors, retrieved August 2017. New Zealand College of Clinical Psychologists, retrieved August 2017. Psychotherapists Board of Aotearoa New Zealand, retrieved August 2017. Robert Street Clinic – Who should I see?, retrieved August 2017. Royal Australian and New Zealand College of Psychiatrists, retrieved August 2017.